In the wake of the MF Global and Peregrine Financial Group (PFG) bankruptcies, customer confidence in the sanctity of segregated funds was decimated. In one case, the funds were misused, in the other they appear to have been stolen outright. In both instances, it became clear the industry needed to make significant changes to convince investors the bulwark was secure. Each bankruptcy revealed weaknesses in the regulatory structure. MF Global trustees still are working to identify what happened, but weak internal controls, disorganized recordkeeping and a margin call on the firm’s proprietary positions are suspect. At PFG, former CEO Russell Wasendorf Sr. pleaded guilty to falsifying audit paperwork and lying to regulators with the expressed intention of defrauding customer funds to keep the firm afloat. 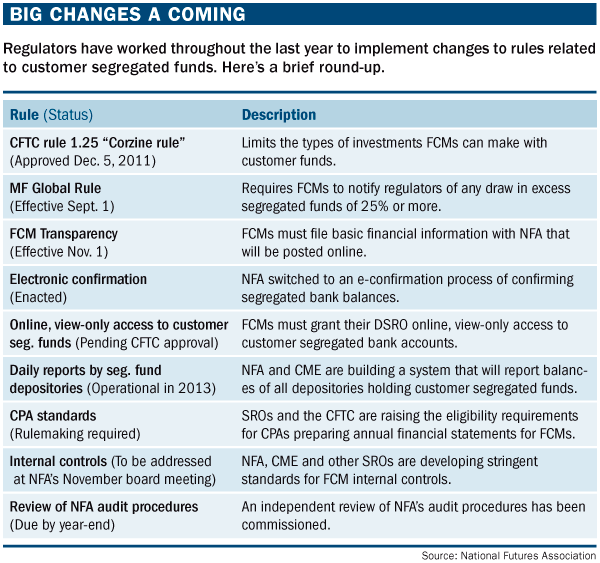 Over the last year industry leaders and regulators have worked to implement changes to reporting requirements at futures commission merchants (FCMs), internal compliance and auditing practices (see “Big changes a coming”). Further, CME Group unveiled a pseudo-insurance fund to protect some members it recognized as being particularly vulnerable. Rogue CEOs and absent regulators: Is there a pattern? Do you want to sell your MF Global claim?